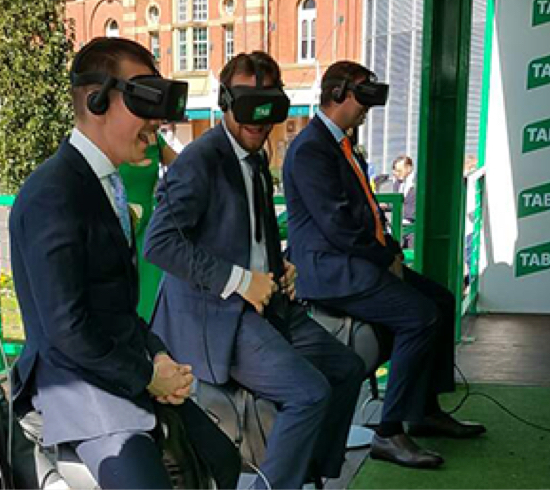 As part of the 2017 Sydney Autumn Carnival, Catalyst helped TAB launch an innovative virtual reality campaign giving race goers, over the age of 25, the chance to experience the thrill of Australian thoroughbred racing in virtual reality. 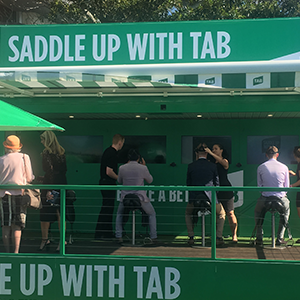 Saddle Up With TAB was specifically developed to immerse participants in some of Australia’s most famous races as if they were actually a jockey in the race. 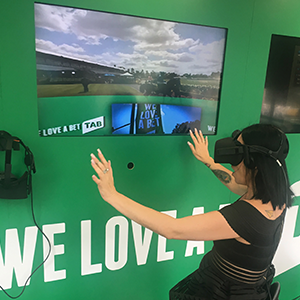 Riding on or against champion horses including Criterion, Chautauqua and Winx Saddle Up With TAB was a truly immersive experience unlike anything Australian racegoers have experienced before. 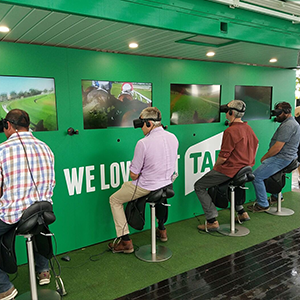 The experience gave participants the chance to take the jockey’s perspective and through virtual reality they could look where they wanted, when they wanted. As well as riding champion horses, participants also experienced behind the scenes at Royal Randwick and Rosehill getting an insight into a day in the life of a jockey and the inner working of these famous racecourses. SADDLE UP WITH TAB WAS A REALLY CHALLENGING PROJECT WORKING WITH FOOTAGE FROM 360 AND TRADITIONAL VIDEO SOURCES. BEING DEVELOPED SPECIFICALLY FOR VIEWING USING A VR HEADSET ALLOWED US TO REALLY PUSH THE LIMITS OF PRODUCTION. The Virtual Reality production for Saddle Up With TAB required the adoption of new techniques in 360 video filming and production. The team at Catalyst’s Sydney and London studios worked around the clock on the project. Filming at Randwick and Rosehill took place using an innovative new, Catalyst built, helmet mounted 360 video camera rig and a variety of 360 video cameras around the track. The elaborate post production work included advanced 360 video animation and new VR techniques to incorporate traditional video footage. 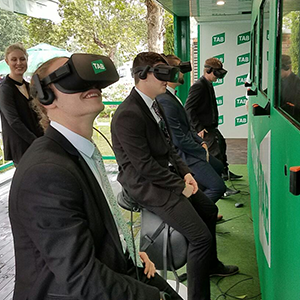 Saddle Up With TAB activations at Rosehill and Royal Randwick featured the latest Virtual Reality headsets side-by-side, allowing up to four friends to race each other. Each virtual reality headset was connected to a large screen display, mirroring what the participant was viewing for spectators to watch. Built into TAB’s custom shipping container participants sat on specially made saddles and held jockey’s whips to complete the immersive experience. 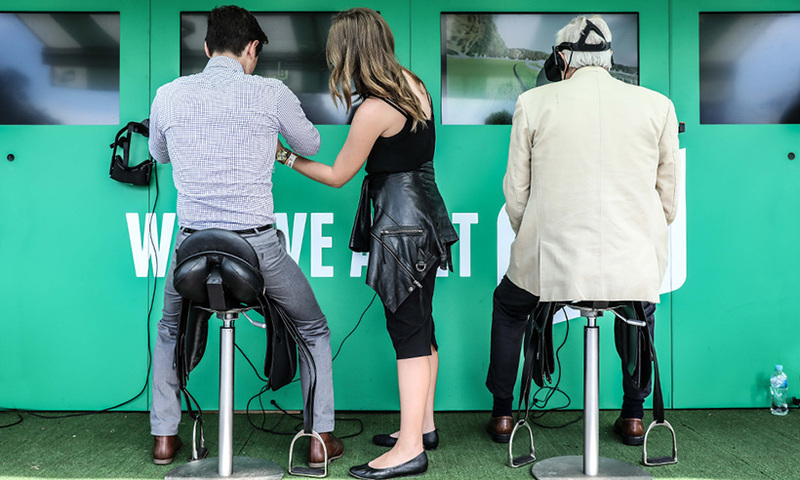 The hugely popular activation attracted a wide range of race goers, all keen to experience the thrill of riding a thoroughbred racehorse and for a moment they probably thought they really were. Horse riding VR has never felt so realistic!